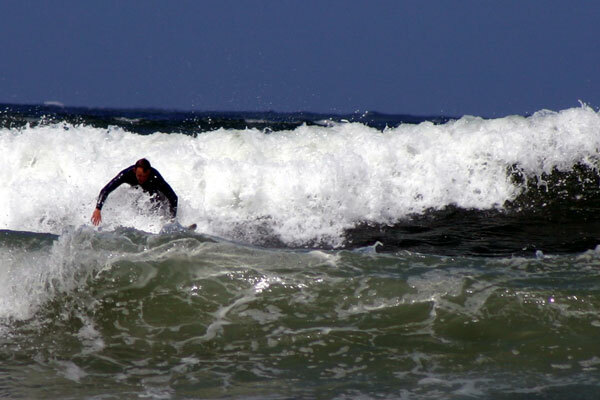 Surfing at Woolacombe. About 12 miles (30 mins) from The Old Forge. Bishops Tawton was once the home of Bishops and the picturesque village church bears testament to many generations of Devonians who made their home in this tranquil corner of the Taw Valley. 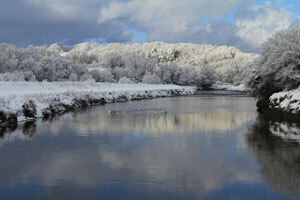 There are walks by the river Taw or great cycling along the Tarka Trail (accessed from Barnstaple Station, approximately 2 miles from The Old Forge). Barnstaple The historic market town of Barnstaple on the banks of the River Taw is 2.4 miles from The Old Forge, offering shopping, restaurants, theatre and cinema. The Pannier Market and Butchers Row is a must for all foodies. Heddons Valley about 13 miles (30 minutes) from The Old Forge, offers dramatic walks through the wooded valley leading to the sea. Park at Hunters Lodge, where you can have a delicious pub lunch or a reviving beer. Codden Hill 5 minutes walk from The Old Forge. Rising over 190 metres, a stiff walk to the top of this ‘whale backed hill’ will reward you with a superb 360° view of much of the county of Devon. 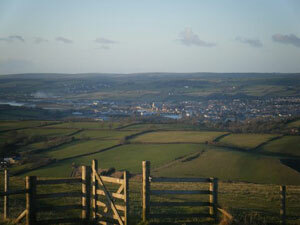 Dartmoor to the South, Bodmin Moor in the middle distance and Exmoor to the North. 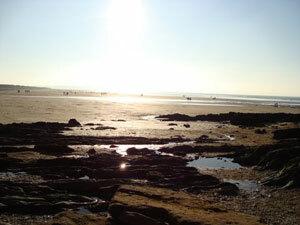 Instow Approximately 10 miles (17 minutes) from The Old Forge. 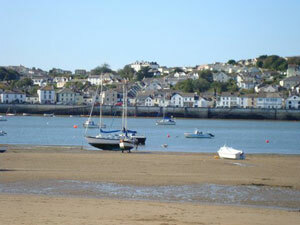 A delightful seaside village with golden sands and a harbour for small pleasure boats and fishing smacks on the Torridge Estuary. Pubs and restaurants along the front. Tapeley Park Approximately 11 miles (20 minutes) from The Old Forge. 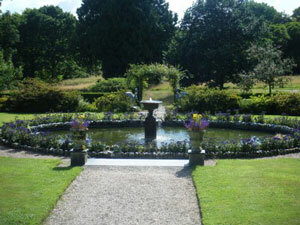 Lovely stately home in impressive gardens, overlooking the River Torridge. Open to the public. Arlington Court Intriguing National Trust Regency house and impressive horse-drawn vehicle collection. About 10 miles (30 minutes) from The Old Forge. Exmoor Owl and Hawk Centre A collection of owls, birds of prey and other animals. Outdoor activities where you can participate in full or half day bird of prey experiences, owl activities and horse riding over Exmoor. About 33 miles (one hour) from The Old Forge. Cobbaton Combat Collection Military museum with a collection of mainly WW2 vehicles and equipment. About 5 miles (10 minutes) from The Old Forge.